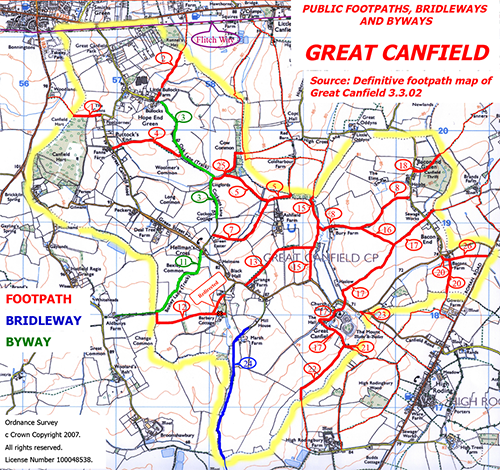 The adjacent map shows public footpaths, bridleways and byways in Great Canfield. You may also wish to see some “Canfield Walks” from one of our residents, Simon Mainwaring. These are introduced below. The definition adopted here is that a "Canfield Walk" begins or ends within the parish boundaries but otherwise can roam all over the place. Each walk is tracked with GPS during the whole of the journey and the track is transferred to its unique Wikiloc page. This page then shows the track against the background of a satellite view or a map, and there is usually a short commentary. The GPS track can also be downloaded for on the spot guidance during the walk. For each walk there is a video, made up from a set of photos taken during the journey. This can be found through a link below or in the walk's Wikiloc page. The videos make extensive use of the footpath numbers shown in the map. Most of the walks are circular and end up at the same place as they started. A few don't, such as the Dunmow to GC and GC to Molehill Green routes. For these, arrangements for pick-up or drop-off are needed. If there are two or more doing the walk it is of course possible to position a car at both ends of the walk beforehand. Similar arrangements could be applied when only doing a section of a circular route. These are not particularly short walks, they cross open country, and surfaces can be uneven and rutted. Clothing should be appropriate to these conditions, and, as always, to the weather. Walking boots with good ankle support are strongly recommended. So far there are 12 Canfield Walks in the collection (download brochure at https://drive.google.com/open?id=0B1s8pVNe5FbBd1FKd1ZhQTBtNkk). However this is not intended to be a one-man show, and others in the Great Canfield Community are welcome to add their own favourites. Each walk is first posted in the Great Canfield Community Facebook group page at https://www.facebook.com/groups/greatcanfieldcommunity/?fref=ts (you will need to have a Facebook profile and become a Member of the group to access this). This site also provides an album of still photos for each walk. Just click on Photos and select the album that interests you. It also contains a reference to the page in Wikiloc described above.